Under able guidance of our skilled professionals, we offer Artificial Resuscitator Child B-S 705 all over the world. We use sophisticated technology and machinery for the process of manufacturing these equipment. This child resuscitator is available with us with the capacity of 500 ml. It is provided with efficient silicon made cuff, a reservoir hosing and enhanced oxygen tubing. We offer it at a diminutive price. Oxygen Reservoir with valve 2600ml. Owing to ethical business practices, we are able to offer highly efficient Artificial Resuscitator Infant B-S 707 all over the world. These products are manufactured under the supervision and utmost care to ensure its defect-freeness. Our products has specificity of 240 ml. it compromises of Type "L" non-re breathing valve with pressure limiting device and Size "O" circular pediatrics face mask with silicon cuff .We manufacture these products in accordance to meet the huge demand in hospitals and clinics all over the world. Non Rebreathing Valve with 40cm pressure release. Oxygen Reservoir with valve 600ml. Standard 15mm inside and22mm outside diameter. 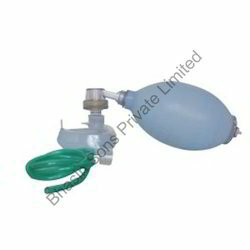 We are the leading manufacturers and exporters of a wide range of Artificial Resuscitator Adult B-S 702, Using hi-tech technology and machineries. 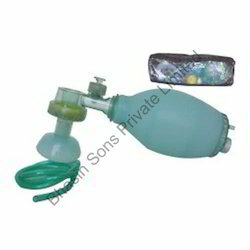 The vital features of these products are extreme sturdiness, which comprises a single unit of self inflating double ended blue silicon bag with mounts and side feed oxygen inlet, Type "L" non-re breathing valve, size 4 clear hood face mask with silicon cuff and 1.5 meter oxygen enrichment tubing. 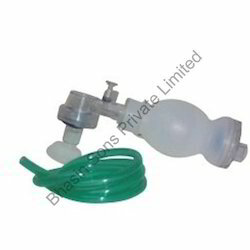 We offer a wide range of resuscitators with capacity of capacity of 1600 ml. These equipment are utilized in all hospitals generally. Looking for Ambu Bag ?